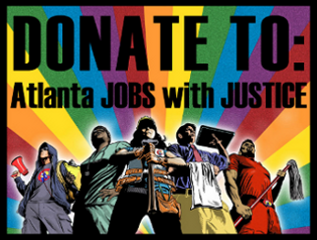 A Speak Out for Jobs Now held April 2 -- intended as a first step toward empowering Atlanta's many unemployed and underemployed people and also a kick-off event for the new Atlanta Jobs with Justice -- drew enthusiastic participants and dozens of volunteers. 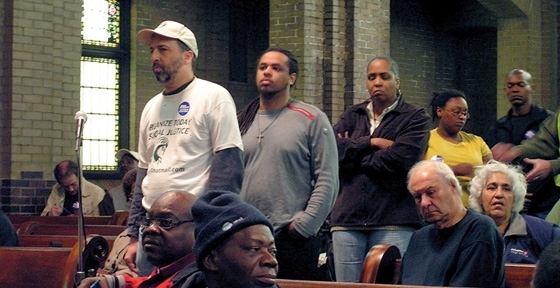 Their statements covered a variety of travails confronting the unemployed, but also repeatedly stressed that the problems are systemic and not the fault of individuals and that working and unemployed people of every race and ethnicity need to unite to fight for more jobs and a society that recognizes meaningful work at a living wage as a human right. 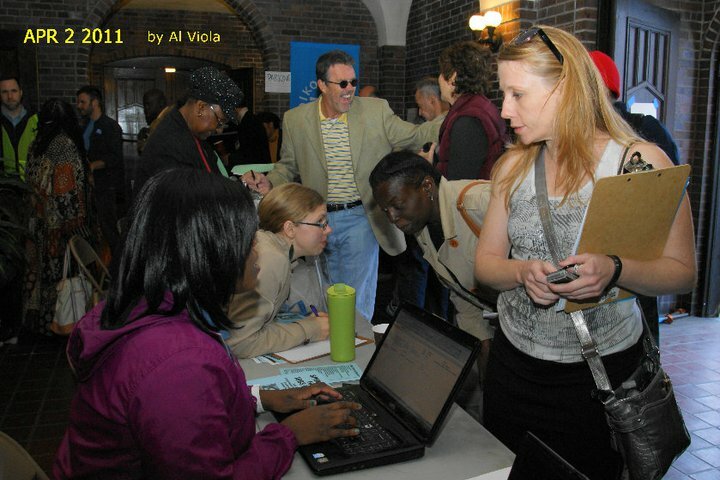 Thirty-eight organizations co-sponsored the event with Jobs with Justice. A large number of people testified, many of whom said they felt desperate and at their wits' end. One young woman explained that she has been looking for a job since she was 12 but cannot get one because she is only 17 and has no work experience. 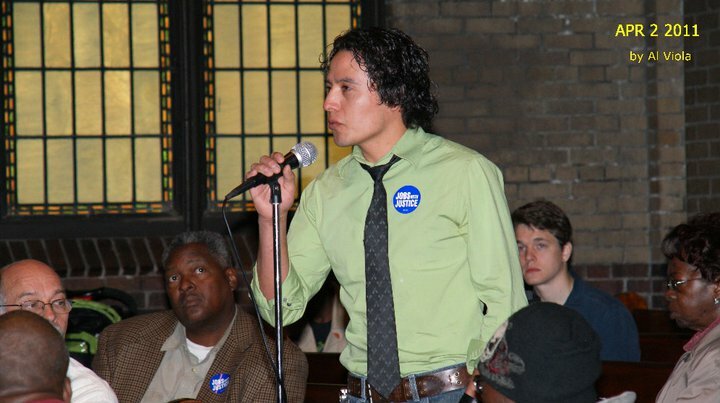 One man testified about how hard it is to find a job with a criminal record. Another man said he has skills and work experience, but spoke about the difficulty of finding a job with a homeless shelter as the only address he can put as his on job applications. Another said "I spent time in jail, got out to a halfway house, but I had no work history so I couldn't find a job." Since he was not able to meet the employment requirements for the halfway house, he was sent back to prison. One woman has worked as a home health aide and has her certified nursing assistant certificate, but reports that she still can't find a job despite good work experience, good resume, good references, and the certification. Another woman explained that she had worked in several different fields, including security and law enforcement and does not have trouble getting jobs -- but she cannot keep them because of anti-labor laws like Right to Work and laws that allow employers to fire employees at will for arbitrary reasons. Still another woman explained that she had had a job but that someone else had been imprisoned with her name, saddling her with a felony record and causing her to lose her job. Now she is entangled in a bureaucratic snare of trying to get her name cleared and her record straight. State Senators Nan Orrock and Vincent Fort responded to the testimony. 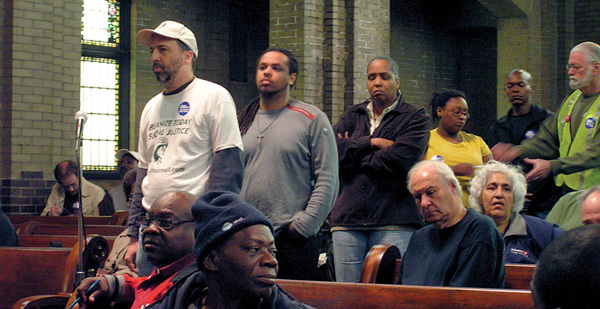 Orrock said "we must...rebuild a movement" of working people to demand fair treatment. She denounced the anti-labor laws of the recent legislative sessions and said public employees "are not harming the economy, they're part of the backbone of the economy." She spoke of the foreclosure crisis and the fraudulent mortgages millions of people were tricked into, and decried the fact that "the person who's losing the home gets the blame, not the people who caused the crisis." She also enjoined the crowd to stand up against the wave of anti-immigrant legislation that has been introduced this session, saying the bills "fuel hatred". She urged the crowd to call their voters' office and the Lieutenant Governor's office and demand that they "kill those anti-immigrant bills. State Senator Vincent Fort said the anti-immigrant legislation is an attempt "to pit black people against brown people ... trying to turn us against each other because they know if we came together there'd be hell to pay." He also spoke against the recent cuts to education passed by the state legislature, saying that they hurt workers because the HOPE scholarship will no longer pay for technical schools. He decried the changes to the HOPE scholarship that disproportionately target poor and minority students, who will lose their scholarship money more than wealthy white ones. Finally, he called on listeners to boycott the lottery, which has been used to fund the HOPE scholarships: "why should you pay to finance your oppression? ... Why should you pay to send a corporate executive's child to school?" He pointed out that "the lottery money comes from working neighborhoods" and goes "from Bankhead to Buckhead". A crew of Jobs with Justice coalition activists representing many labor and community organizations, plus individual volunteers, had worked hard for weeks organizing the event, which took place in Trinity United Methodist Church just south of the Georgia State Capitol -- where the legislature, like other Republican-dominated state governments, is ignoring the struggles of the unemployed and may even fail to draw down federal funds that would extend their benefits, despite the fact that Georgia's unemployment rate of 10.2 has exceeded the national rate for the 41st month in a row. Popular WAOK talk show host Derrick Boazman moderated the Speak Out, which opened with an inspirational poem, "Rise!" 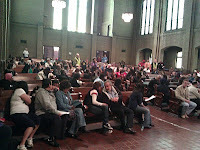 by Alice Lovelace and closed with a reading of Chicano activist Corky Gonzales' poem "I am Joaquin" by Raul Cedillo of GLAHR All the speakers were videoed by Jess Bowling and other volunteers, and Jess continued to tape statements by attendees throughout the afternoon. The testimony will be edited and distributed through YouTube and other outlets. Spanish interpretation of the Speak Out was provided by South to North Communications. Kelli's Childcare Collective kept about 15 children happy throughout the day. 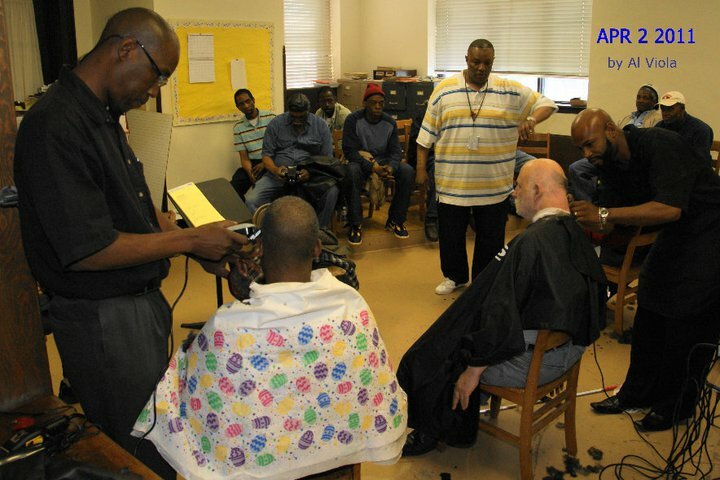 After the Speak Out, participants crowded into the church's Fellowship Hall, where they were offered a box lunch and a variety of services ranging from haircuts and massages to legal advice on housing issues and how to expunge an arrest record. Forty-one volunteers from 22 organizations supplied the services, including childcare, at no charge. Many speakers also laid down concrete next steps for attendees to follow to demand jobs with justice --"not slave jobs, but jobs with a living wage, with benefits, and enough leisure time to spend with our families," said JwJ organizer Tony Romano. 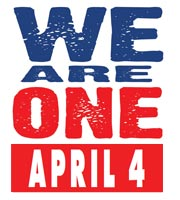 Organizers called for everyone to join the We are One march that went from the King Center to the Capitol on April 4, the anniversary of Martin Luther King Jr.'s assassination, to demand respect for workers' rights. King was killed when he was in Memphis supporting striking sanitation workers who were demanding fair treatment. Where will JwJ and the many who responded to the call to speak out for jobs now! take their message next? 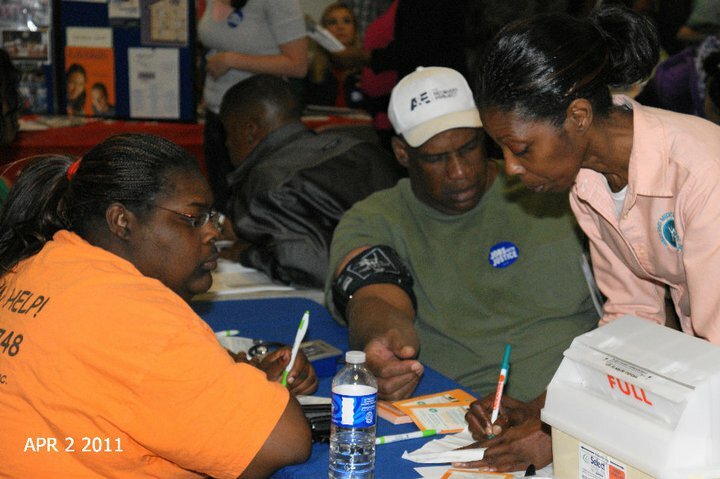 As federal, state and local governments plan more layoffs and cuts in benefits and essential services, but no serious jobs program, their voice is needed more than ever.